•	Milton Roth in the bathroom, which doesn’t look that much different from today. It’s nice to get to know the builder and paterfamilias, through his family. We expect to see more of the family this summer or next, for a planned reunion. 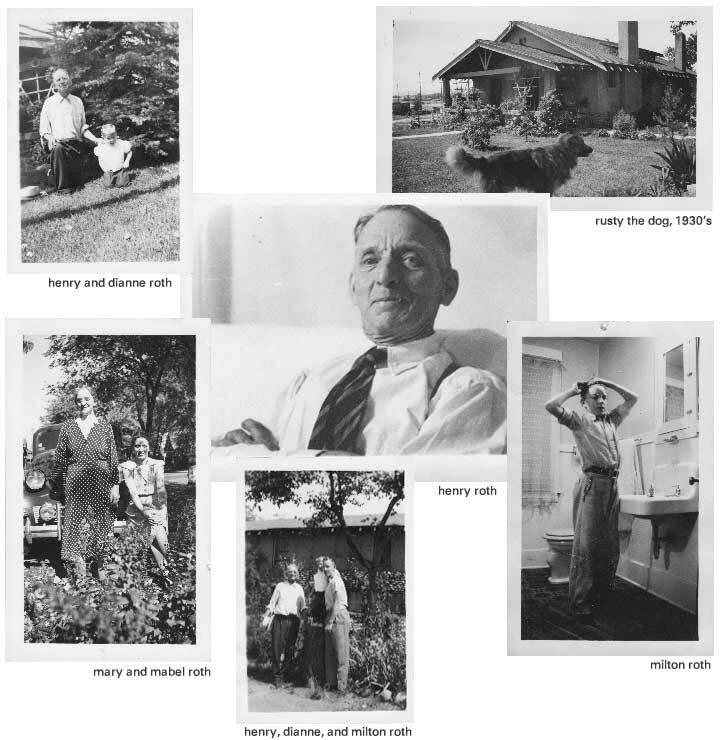 B50 note: Henry Roth built the bungalow style houses in the Baker Neighborhood by hand in the 1920’s and 1930’s. The house is on the national historic register. 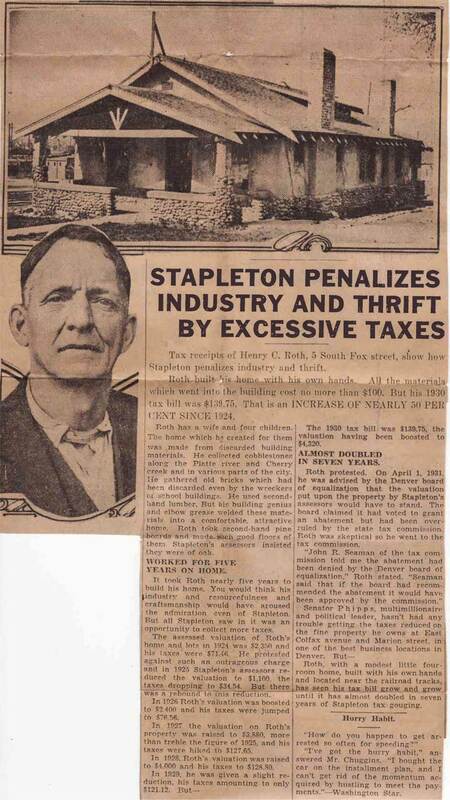 M Thornton added this as a postscript to his original post, The Henry Roth Houses on Fox Street. In 1931, there is a record of his proposal for six murals there for which he was to be paid $15,000. There was controversy about the number of murals and payment, which seems to have slowed up the project. According to the April 9, 1949, edition of the Rocky Mountain News, the judges of the district were again to consider a request, this time by “of a group of civic leaders” for True to paint murals in offices of the court clerks. In the April 13, 1949, issue of the Denver Post, Richard Dudman reported, “An intramural controversy was brewing Wednesday in the Denver city hall. Quick reaction came from three sources to the awarding of $6,000 commission Tuesday to Allen T. True, Denver artist, to paint two murals in the offices of the clerks of the Denver district and county clerks.” The article reported that one judge wanted to approve the mural before it was installed. The chairman of the Denver art commission said his commission must approve them and an artist complained that there was no open competition. Dudman speculated that a “taxpayer’s suit” might arise. An agreement finally was signed June 10, 1949, “by and between the District Judges sitting in and for the Second Judicial District of the State of Colorado, parties to the first part, and ALLEN TRUE, of the City and County of Denver, Colorado . . . to paint a mural decoration [Miner’s Court and Frontier Trial] approximately eight feet four inches by twelve feet” in the rooms occupied by the Clerk of the District Court and the Clerk of the County Court “for a total sum of $6,000.” The contact mentioned that the two sketches had been approved by the mayor, the Municipal Art Commission, and the Honorable C.E. Kettering, judge of the County Court of Denver. Oh, how slowly the gears of government grind. True began work on the two murals at his Raleigh Street studio in Denver. After the contract was signed and the bickering at an end, the following article appeared in the Denver Post: “Workmen will begin Monday to prepare the walls in the offices of the clerks of the District and County Courts to receive murals painted by Allen T. True, Denver artist. Mr. 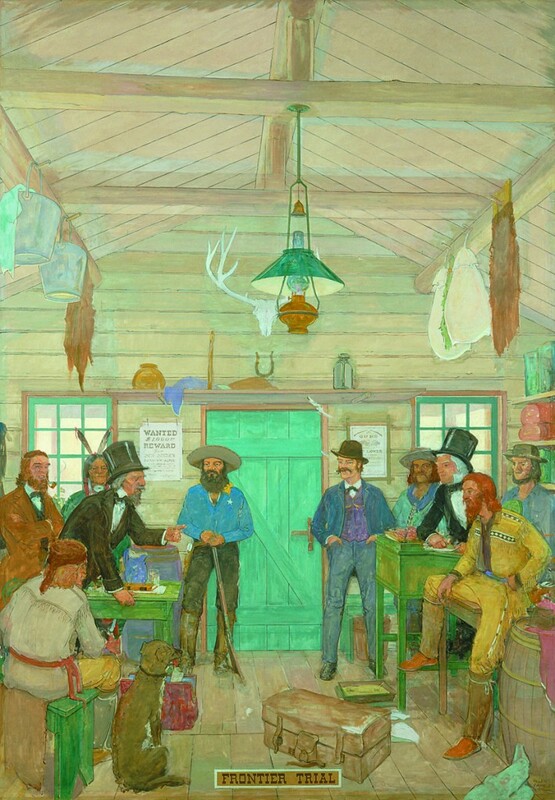 True was commissioned to paint a mural for the District Court and another for the County Court of scenes depicting early Colorado justice. B50 Note: Victoria Tupper Kirby is the granddaughter of Allen Tupper True and co-author with her mother and True’s daughter Jere True of the biography Allen Tupper True: An American Artist (available at Tattered Cover bookstores and on Amazon.com). 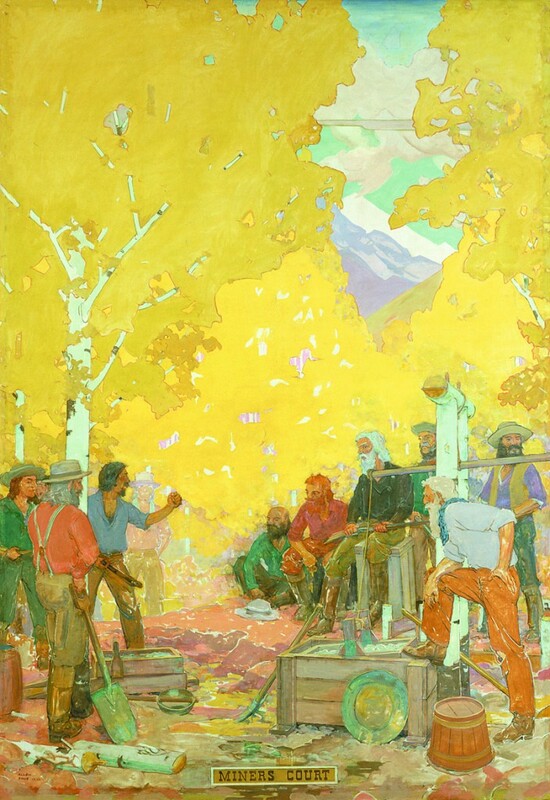 Colorado Artist Allen Tupper True (1881-1955) was a prolific painter, muralist, and illustrator whose work graces many buildings and monuments nationwide, including the state capitols of Colorado, Missouri, and Wyoming, as well as murals for the Civic Center and the Mountain States Telephone and Telegraph Company Building in Denver. Other True murals can be seen in the Brown Palace Hotel, Denver Civic Center Park, and the Colorado National Bank. He also designed the decoration and color schemes for the Boulder Dam power plant, Grand Coulee Dam, and the Shasta Dam, among others. His work is currently the subject of a wide ranging retrospective, Allen True’s West, presented by the Denver Art Museum, the Colorado Historical Society, and the Denver Public Library. 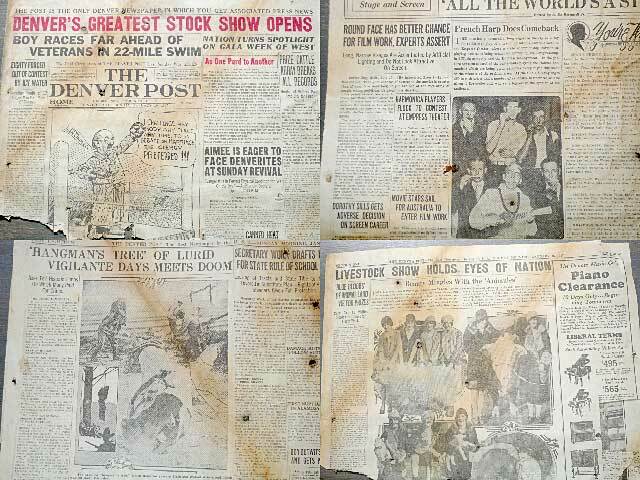 Amy Semple McPherson, the great evangelist of the 1920s, comes to Denver, coincidentally with the Greatest Stock Show ever; the French harp, or harmonica, makes a comeback; the hanging tree at Sixth and Walnut meets its doom; the stock pages and society columns mix for the Livestock show; the Vanderbilts and distance swimmers were hot news a few years before the collapse; putting a man on the moon was a foolish dream indeed – read all the details; on the same page that one of Custer’s troops is mourned, a Klan Cyclops runs for Congress; Clayton College, located at what is now Colorado Boulevard and Martin Luther King, Jr. Drive, helps half-orphans become useful citizens; America’s auto industry is growing, and car camping takes off for the hills on July 4, 1926; the Jazz Age has already become history; girls paint designs on their legs for the sake of allure; what we know as the Hagia Sophia was rumored to become a disco; Mutt and Jeff and The Katzenjammer Kids, with their German accents, ruled the funny papers, the only part of the news in color, Sundays only; Classified Ads still brought in the bucks; a trout-fishing resort on “4 acres, a nice hotel, a 5-room cottage, 9 cabins” all to be sacrificed for $6,500; and finally, what was cut out between “‘Billy’ Adams” and “Her Worst Worry”? Architecturally, the Western History Reading Room of the Denver Public Library is one of the most elegant locations in town, with its Michael Graves-designed wooden “derrick” holding the center space and the book shelves and seating areas radiating out from that, like wagon wheel spokes, or like the panels on a windmill’s wheel. That sounds great, but talk is cheap. The trick is that this group delivered, and sixty years later, they still do, as evidenced by this show. Some of Denver Art Guild’s members had strong careers that have carried their names into our own era. Gladys Caldwell Fisher’s sculptures remain (her “Rocky Mountain Sheep” grace the original main Post Office downtown); Laura Gilpin made a strong name for herself in photography; Vance Kirkland’s reputation has grown steadily, bolstered by the museum that bears his name; Charles Waldo Love’s dioramas at the Denver Museum of Nature and Science are a core strength in that facility; John Edward Thompson’s decorations remain at St. John’s Cathedral, and Allen Tupper True’s murals can be found throughout the city. Some founding members moved on, to become better known – or court obscurity – in other parts of the country. As the Depression took hold, some by necessity disappeared as professional artists, which means that some of these artists, despite their gifts, are now largely forgotten. This exhibit brings together work by all of the founding members, providing a snapshot view of the wealth of talent working in Denver in the late 1920s, contrary to old stereotypical beliefs that Culture didn’t exist west of the Mississippi (references to “fly-over country” are sad indications that such ideas haven’t really vanished). As Wadsworth and Jennings point out, over half of these fifty-two artists had trained in Europe (six were born there), and an equal number in studied in New York City. They traveled widely, and were aware of and influenced by the contemporary artistic movements of their time. Hints can be found here of Impressionism, Cubism, Expressionism and Abstraction. The Denver Artists Guild exhibited as a group at the Denver Art Museum, and had a seat on the DAM’s board. Yes, voting representation of local artists at the local art museum (which was, after all, founded by local artists, via the Denver Artists’ Club in the 1890s) – what an intriguing concept! While the works included are by the 52 founding members, the individual pieces date from varying eras in each artist’s career, and inclusion has been based (at least in part) on availability, rather than showcasing the strongest pieces by each artist. “Wish-lists” notwithstanding, curators can only show the works they can locate. In the realm of the totally subjective, I’ll mention a few of the stand-outs. “Frozen Pond” (1918, oil/canvas) by Albert S. Bancroft (1890-1972) is pristine like a crisp winter day: You can nearly smell the cold air. The detail in this small work has that same sense of heightened clarity, and comes across as an example of photorealism as a result. There are three strong lithographs here by modernist Arnold Ronnebeck (1885-1947), two NYC cityscapes and one western landscape, “Rain Over Desert Mesas” (1931) that captures the moodiness of weather and the expansiveness of the land. It’s a quietly powerful piece. The large “End of Summer” (undated, oil/canvas) by Louise Emerson (1901-1980, better known now as Louise Emerson Ronnebeck – the curators list the artists under the names they held at the time the Guild was founded) is one of the treats in this exhibit. Two girls curl up together on their seat in a train, sleeping, as they pass through a desert landscape. Back to college after a summer spent helping on the family ranch? Heading home to the southwest following a big-city vacation? The viewer gets back-story speculation along with the masterful visual treatment: it’s a grand painting. There’s a just-right “Landscape” (undated, watercolor) by Grace Church Jones (1868-1959) that captures the softness of the hills unfolding themselves into the distance, punctuated by a few trees. The sense of place – rolling plains, perhaps an unseen creek – is evocative despite the apparent simplicity of the piece. I first saw John Edward Thompson’s still-life “Green Thermos Jug” (1943, oil/canvas) several years ago and am glad to find it again here. Thompson (1882-1945) is one of the bigger names in this group, which might make this arrangement of mundane objects seem a bit trivial. 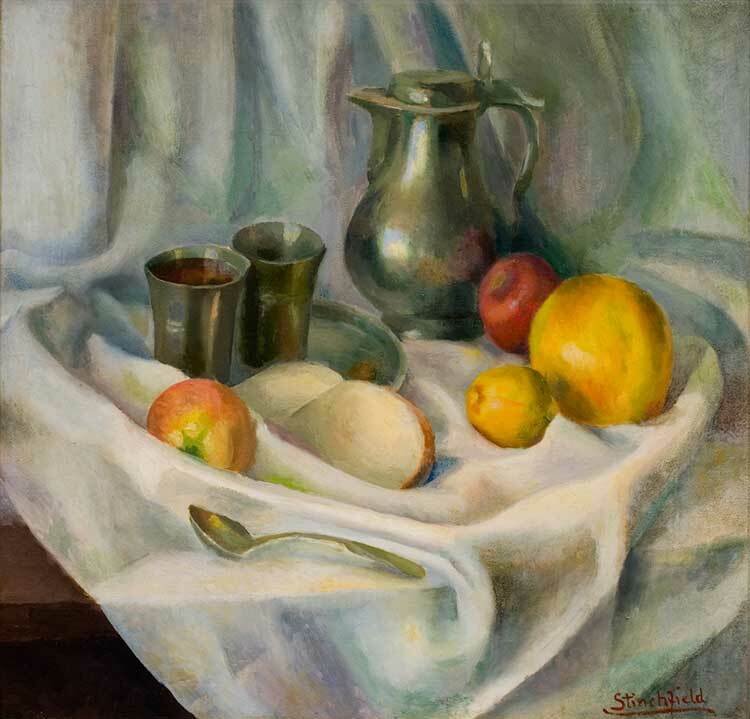 Instead consider all those dusty old classical still-life paintings that center around a somber ewer (probably full of ale, milk or cider), ensconced among fruits and vegetables, symbol of bounty and a rich pastoral feast. To the modern eye, isn’t a thermos jug the new equivalent? The newer 21st century thermos looks a bit different than this post-WWII model, but it’s still the thirst-quenching thing we tote along on picnics. Thompson’s painting is formal and very traditional in composition, but true to his own era in terms of the objects he chose to portray. These are just a few of the hits, and there’s plenty more good stuff in this show, including photographs, magazines, exhibition catalogues and children’s books from the period. Given the traditional materials, formal presentation, thoughtful display and elegant frames, the chosen works feel appropriate and totally “at home” in their Reading Room setting. This is a great show for anyone curious about Denver’s cultural identity in earlier times. Anyone who simply wants to enjoy a strong and very viewer-friendly art exhibit: Here it is. On a final historical-update note, artists’ associations are alive and very well in Denver. Among just six of the city’s co-operative galleries (Core, Edge, Next, Pirate, Spark and Zip 37), I counted roughly 180 full and associate members, and these are just the galleries that I’m aware of or for which I could find membership figures. While these groups are sometimes (foolishly, mistakenly, perhaps arrogantly) given short shrift in their hometown press, they’ve been the proving grounds – where artists can be nourished, grow and mature – at the heart of Denver’s art community for over 30 years. Oops, scratch that “30 years”: That’s just the era I’m familiar with. Denver’s art-associations go back much farther, to the Denver Artists Guild’s founding in 1928 and beyond. They clearly express the willingness of artists to choose community over competition, to band together to create their own opportunities, to create a culture in which all can flourish. This exhibit provides new context with which to view the city’s modern artistic vitality. 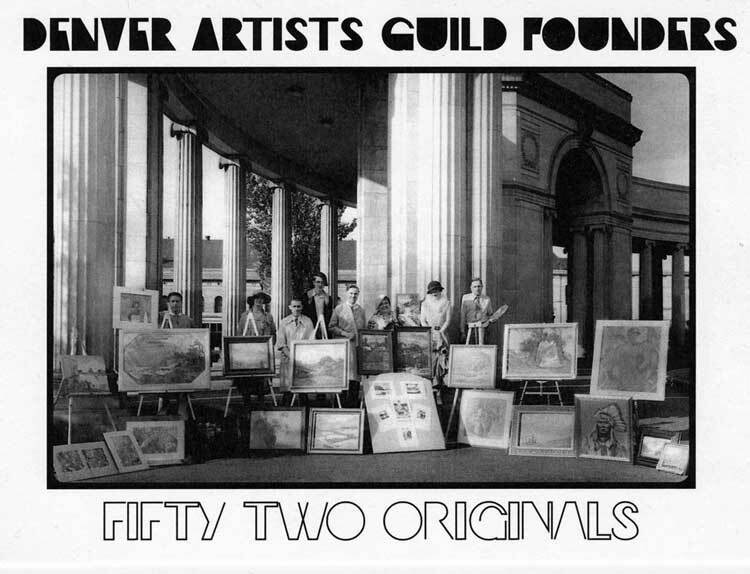 “Denver Artists Guild Founders: Fifty Two Originals” is a rich, intelligent and welcome exploration of our artistic roots. Art grows well here. Let’s appreciate our heirloom plants. B50 Note: Long time Colorado resident Renna Shesso is a writer and independent researcher whose work focuses primarily on art and spirituality. She is the author of Math for Mystics (available from Amazon.com), and can be reached through her website, rennashesso.com. Excerpted from “Colorado: A History”, published in 1984 by the American Association for State and Local History. Reprinted in paperback in 1996 by W.W. Norton & Company and available from Amazon.com. “1921 marked the start of one of the most serious aberrations in the state’s history—the rise of the Ku Klux Klan under the Grand Dragonship of a strange Denver physician Dr. John Galen Locke. Many residents of Colorado, like Americans everywhere, found themselves full of fears after World War I—fears of hard times, of the communism of Karl Marx, of Eugene Debs and his American socialism, of the Industrial Workers of the World and their violence, of spies in the land working for foreign governments. To these fearful people, especially in the Front Range cities, Locke’s program of “One Hundred Percent Americanism” had great appeal. They found joy in Klan activities, dressing in sheets, burning crosses on Table Mountain near Golden and atop Pikes Peak, and boycotting the businesses of their opponents. They persecuted Catholics and Negroes and, especially, successful Jews such as Jesse Shwayder, the son of a Polish immigrant who had created the huge luggage firm, Samsonite Corporation. The Klansmen took advantage of the unemployment to attack recent immigrants to Colorado from Greece and Hungary who had jobs in the Denver smelters around the Globeville section and at the C. F. & I. steel works of South Pueblo. The Klansmen advised Denverites to cease patronizing restaurants bearing “foreign” names like Pagliacci or Benito or Ciancio or Wong or Torino. B50 Note: It is difficult to imagine the amount of power and influence the Klan held in Denver and Colorado between 1920 and 1926; Mayor Ben Stapleton and Governor Clarence Morley were both members of the “Silent Empire.” Eighty years later, Colorado is the only state in the country to have both houses of its legislature headed by African-Americans (Terrance Carroll and Peter Groff). Marshall Sprague was a author and historian, well known for his prose about the American West. 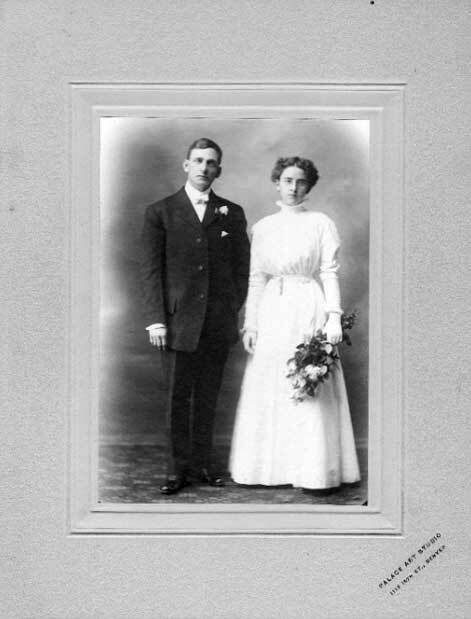 Images are courtesy of The Denver Public Library Western History Collection. The definitive resource on this topic is “Hooded Empire: the Ku Klux Klan in Colorado” by Robert Alan Goldberg, published by University of Illinois Press in 1981. A review of the book (from 1987) is available on Dark Cloud’s site.